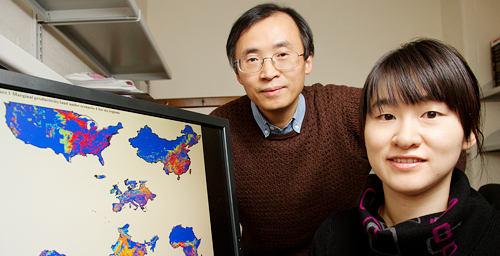 Professor Ximing Cai and graduate student Xiao Zhang predict that the effects of climate change and population growth on agricultural land areas will vary from region to region. CHAMPAIGN, Ill. - The effects of climate change and population growth on agricultural land area vary from region to region, according to a new study by University of Illinois researchers. Regions with relative high latitudes - China, Russia and the U.S. - could see a significant increase in arable land in coming years, but Africa, Europe and India and South America could lose land area. Civil and environmental engineering professor Ximing Cai and graduate student Xiao Zhang published their findings in the journal Environmental Research Letters. While most other studies of climate change and agriculture have focused on projected crop yields, the Illinois researchers assessed global and regional land availability. Using international land and climate datasets and remote-sensing land-use maps, they systematically studied worldwide changes in soil temperature and humidity with a resolution of one square kilometer. "This study presents the main patterns and trends of the distribution of potential arable land and the possible impacts of climate change from a biophysical perspective," Cai said. "The possible gains and losses of arable land in various regions worldwide may generate tremendous impacts in the upcoming decades upon regional and global agricultural commodity production, demand and trade, as well as on the planning and development of agricultural and engineering infrastructures." Cai and Zhang's model allowed them to address the many sources of uncertainty in trying to predict climate change, such as levels of greenhouse gas emissions, climate model uncertainty and ambiguity in land-use classification. They applied the model to several projected scenarios to uncover both regional and global trends in land availability. When considering effects of climate change, residential sprawl as population grows and natural conservation, the global total of potential arable land in all scenarios decreased by the end of the 21st century, by a margin of 0.8 to 4.4 percent. However, much larger changes were predicted regionally. For example, arable land area could increase by 37 to 67 percent in Russia, while Africa could lose up to 18 percent of its farmland. "Although the magnitudes of the projected changes vary by scenario, the increasing or decreasing trends in arable land area are regionally consistent," Cai said. Next, the researchers will conduct more detailed regional studies to confirm their global findings. They hope to use their projections to evaluate world food production, demand and trade, and the corresponding implications for policies and investments. The Energy Bioscience Institute at the U. of I. and the U.S. Department of Agriculture supported this work. Editor's note: To contact Ximing Cai, call (217) 333-4935; e-mail: xmcai@illinois.edu. The paper, “Climate Change Impacts on Global Agricultural Land Availability,” is available online.